Yesterday I took the train to Porto. I’ve been busy with work and it was the first chance I had to explore. One of the first things I noticed about the city is there are a lot of inclines, so Porto won’t be a good choice for anyone who has mobility issues. I walked out the train station, turned left, and headed up a steep incline. I had no idea where I was going, but it turned out I’d made a good choice. When I reached the top of the hill I headed down and found myself standing on the Dom Luís I Bridge. I was exactly where I wanted to be. While I was traveling on the train, it went over a high bridge and when I looked out the window there was a breathtaking view of the River Duoro running through the center of the valley below. There and then I made up my mind I wanted to explore an area with a view like that. My decision to turn left when I left the station had brought me to exactly where I needed to be and I spent quite a long time taking photos and admiring the view. Steep terrain is nothing new for a Yorkshireman like me, but I’ve spent the last two years living in the Netherlands. It’s nice and flat there, so I’d almost forgotten what it’s like to stand on high ground. The Dom Luís I Bridge is it has two levels. Where I was standing at the top is for trains and pedestrians. The lower level is for pedestrians as well, but they share the bridge with cars and other motor vehicles instead of trains. I was surprised to learn that, once you have crossed the bridge to the other side of the river, you have left Porto and entered Vila Nova de Gaia. Now here’s an interesting thing, Porto is famous for its wine industry, but the truth of the matter is, the wines are produced on the south bank of the river, in Vila Nova de Gaia, not in Porto. 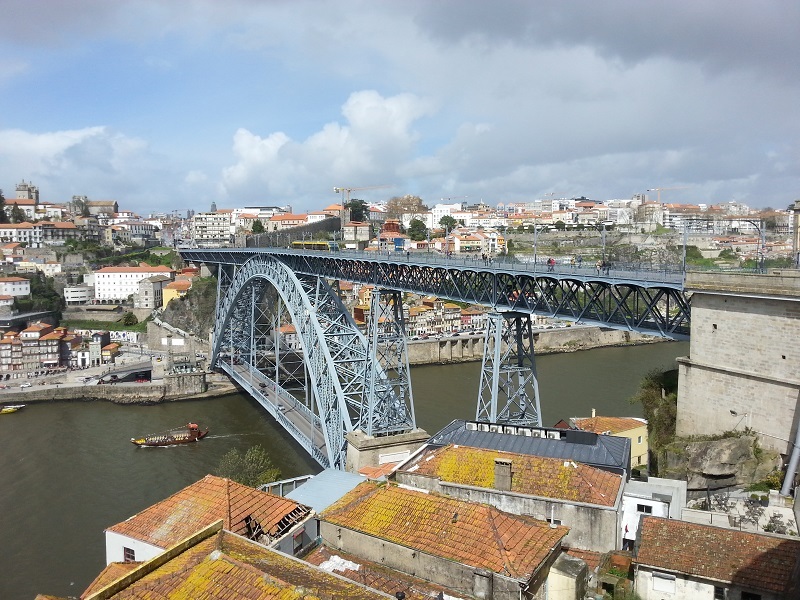 Like New York, London, and Utrecht, Porto is not just a city. It’s a district as well. Porto is the capital city of the Porto district and Vila Nova de Gaia is another city in the district. More than 50 winemakers are situated in Vila Nova de Gaia and most of the wineries, known locally as caves, welcome visitors in for tours (at a price). The caves are a popular tourist attraction, but I didn’t have much interest in visiting one. I may do at a later date. On Saturday I was more interested in just walking around and getting a feel for the city. It’s a steep hike from the lower ground, near the river, to the higher ground at either side of the bridge, but there are other ways people can make the journey if they don’t want to walk. People on the Vila Nova de Gaia side of the river can take a cable car and there’s a funicular in Porto. Being a man that likes to experience new things I was keen to try some local cuisine and taste some of this famous Porto wine I’d heard so much about. I made a point of avoiding the establishments near the river because I thought they’d be more expensive. I chose somewhere closer to the historic centre of Porto instead. I had one glass of Porto wine and a portion of francesinha. That cost me just over €16. I think that’s expensive for Portugal, so I’d obviously not been as smart in picking a place to eat as I hoped. I wasn’t offered a receipt, so I have no idea how much the meal cost or how much was for the wine. The wine was fantastic though. I’ve never tasted such good wine in my life. 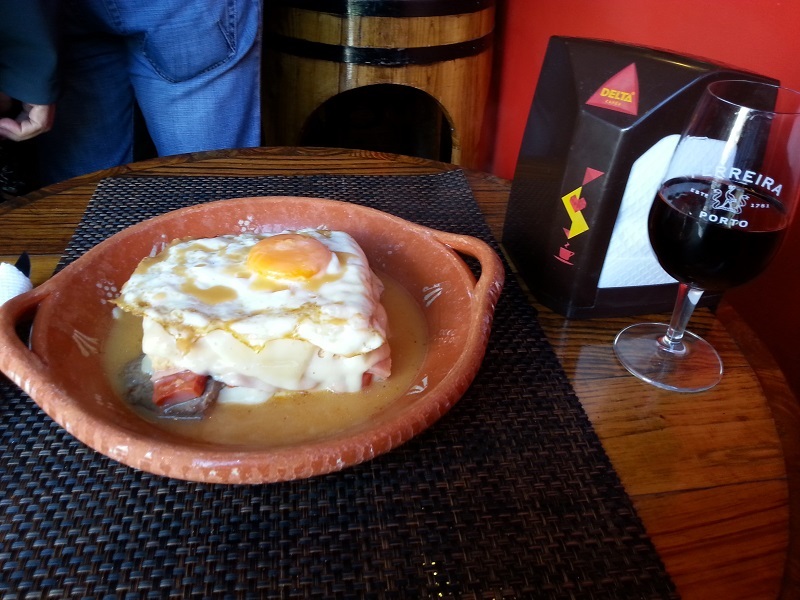 I was not impressed with the francesinha though, and will not be having it again. After wandering about a bit more, I made my way to the Clérigos Church. The Torre dos Clérigos (Cleric’s Tower) is a “high point” of the city and, once you reach the top you get to see the city from a whole new perspective. It’s an impressive view. I’m not good with heights, so my heart was in my mouth, but it’s a good view. It cost me €5 for my ticket, but that’s a pretty good deal because the route up to the tower took me through a museum. There was plenty to see, but religious exhibits are not really my thing, so I didn’t dawdle too long. 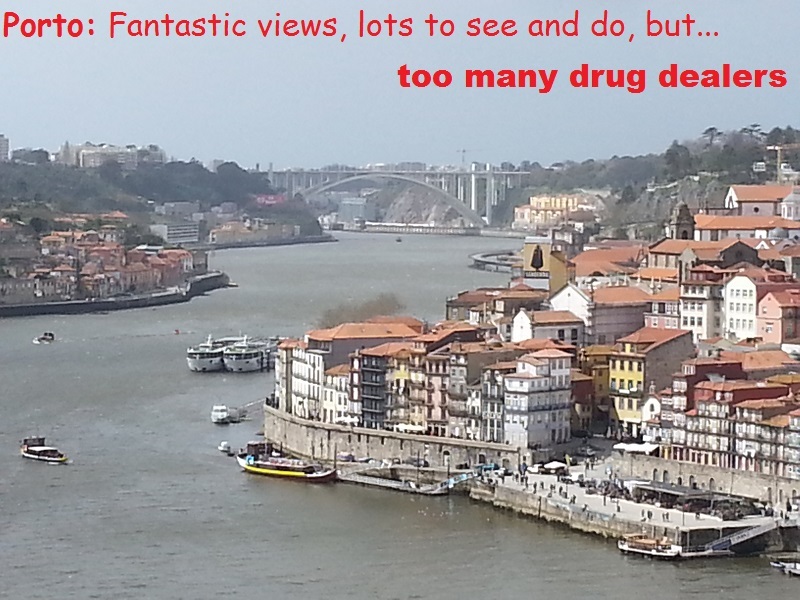 I enjoyed my first visit to Porto, but there was a fly in the ointment. I was approached several times by people trying to sell me drugs. I’ve been to a lot of cities, but I’ve never been pestered like that before. One guy pulled a plastic bag halfway out of his pocket and asked me if I wanted some marijuana. I said no and continued walking. Another guy began by trying to sell me sunglasses. I said I didn’t need any, so he offered me some marijuana. He spoke good English, so I explained to him I don’t use drugs. He looked thoughtful for a moment and then asked if I’d like to buy some coke instead. Situations like that give a whole new meaning to “high” pressure sales tactics.